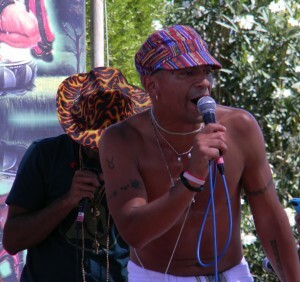 The Bhakti Beat @ Shakti Fest: We’re crazy about the “Bhakti Dance” with the dancing, rapping Latino yogi known as Lokah (“Loco Lokah” to some!). He jumped on stage toward the end of Deepak Ramapriyan and Breath of Life Tribe’s set Saturday afternoon at Shakti Fest and led the crowd in an exuberant dance lesson that jumped and weaved and twirled its way throughout the front-stage seating area before settling back into a meditative prayer. 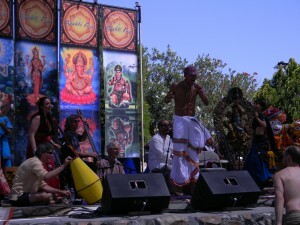 Deepak and the Tribe provided the soaring soundtrack for the choreography with a joyous Radhe chant. Watch what Loco Lokah does at about three minutes in. Sure caught us by surprise! Lokah Bhakti jumps in with the Temple Bhajan Band for a little Krishna rap. We say ki JAI to that. Like what you see? Think about chipping in! All contributions go toward helping keep the lights on.